Typically, in a single shift working environment using electric lift trucks that charge their lift truck batteries only once a day, companies can expect their forklift battery to last five years on average. It is possible to extend the life of your batteries with proper battery care and maintenance. Not following these general tips can drastically lower your lift truck battery’s useful life. 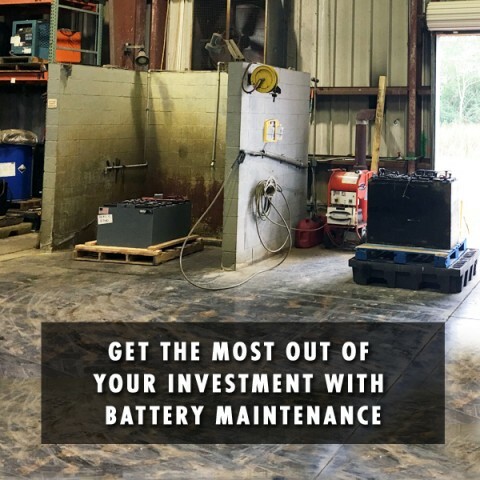 Make sure when a forklift battery reaches a discharge level reading of 20% to 30% charge remaining, that you stop using the battery immediately and place on its charger. 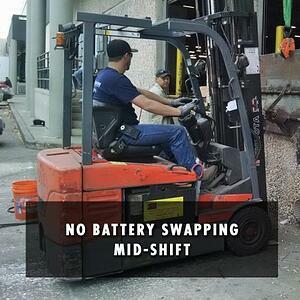 If you use your lift truck battery when in the red zone of 20% charge remaining, or lower, you are reducing the useful life of the battery, risking electrical components overheating and damage to your lift truck. Make sure that you don’t let batteries discharge beyond 80% to sit around for an extended period of time as this will greatly reduce its useful life. Every battery, even the one powering your smartphone, has a limited number of charges in it. 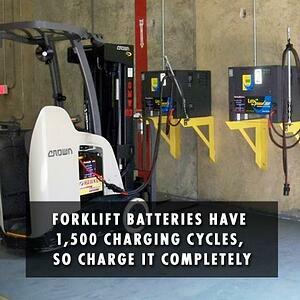 Forklift batteries on average have 1,500 charging cycles in their useful life. 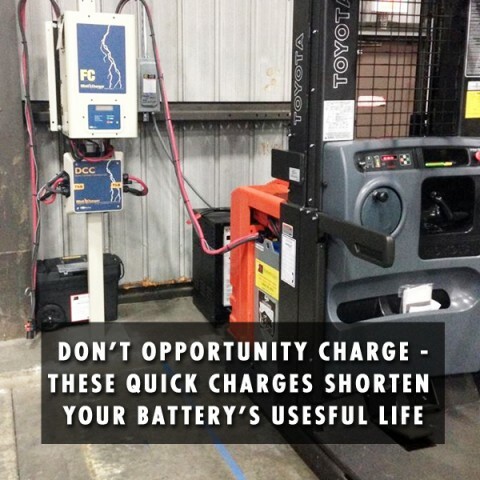 Note that your lift truck battery does not distinguish between full and or half charging (opportunity charging). Opportunity charging a half charged battery still ‘burns’ up a charging cycle in the useful life of your battery. Opportunity charging should only be down when absolutely needed to get the best lifespan out of your batteries. External temperatures of 92 degrees Fahrenheit inside, for example, a warehouse where batteries are stored, used, and charged can diminish battery life by as much as 50%! Can you believe that? 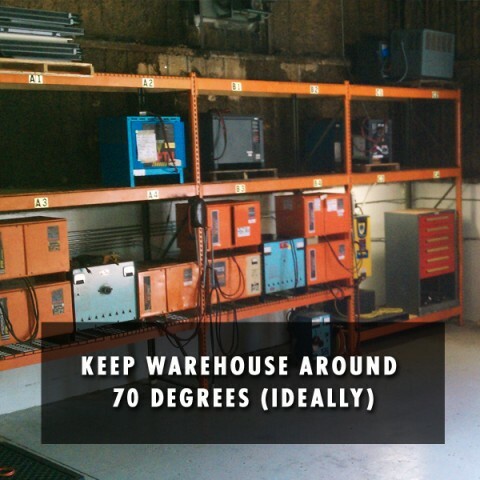 It’s true, so it is important to keep the temperature of your warehouse as close to moderate weather as possible by utilizing warehouse fans and ventilation or by climate controlling your facility. On the colder side of the spectrum your lift truck batteries performance contracts by 30 percent when in temperatures of 30 degrees Fahrenheit or less. If you must operate your forklift in harsh temperatures make sure you invest in a battery designed for those harsh conditions. 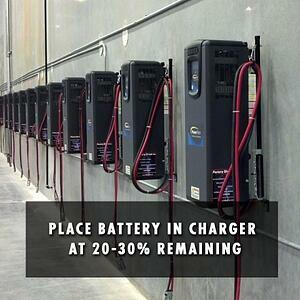 As outlined above, the optimal time for charging your forklift battery fully is between 20%-30%. Opportunity charging a battery with 50%-60% battery charge left wastes the remaining 20%-30% charge as well as a charging cycle. Doing so will waste energy stored in your battery and reduce its useful life by one charge cycle. As discussed above opportunity charging, or quick charges, shorten your battery’s useful life. Remember lift truck batteries are ‘born’ on average with 1,500 charge cycles. If you charge your lift truck battery once a day, it should last five years. Operations charging their battery twice a day cut the useful life in half to 2 ½ years! Get the most out of your battery by not discharging battery below 20% and by completely charging to 100%, never interrupting charging cycle until complete. Make sure that a trained battery maintenance specialist inspects battery water levels once a week. If water (distilled) is needed, make sure that each battery cell is not overfilled and to clean corrosion on top of batteries once a month. Southern States Enterprise’s battery maintenance experts are here to help you get the most out of your lift truck batteries. Contact ustoday to have questions answered or to learn more about our battery product and service offerings. Electric Vs Gas-Fueled Forklifts: Which Saves You the Most Money?